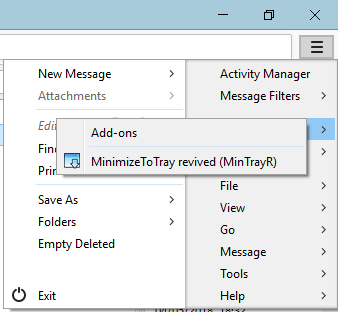 The extension MinimizeToTray revived (https://addons.mozilla.org/en-GB/thunde ... y-revived/) no longer works on Thunderbird 60 beta, there are no other working addons either with this functionality either. This is the 12th most popular thunderbird addon. This badly needed functionality needs to be integrated in to thunderbird. 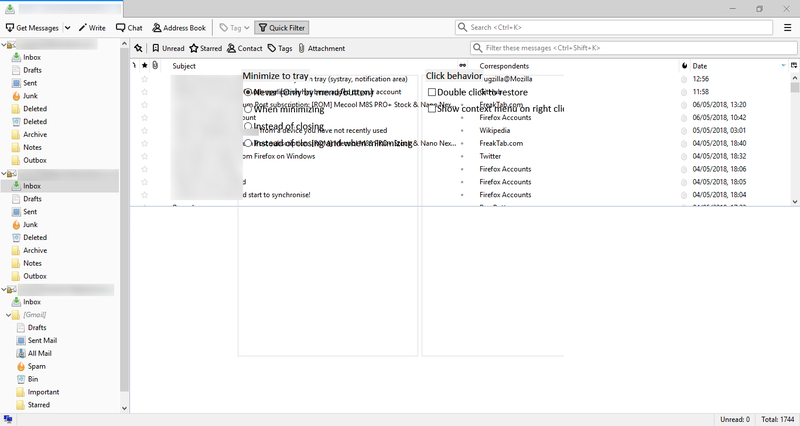 We cannot do anything with either Thunderbird or Firefox. This is just a user-to-user help forum. &, I doubt whether any "feature" will be added to Thunderbird. either program, how large the D/L would become. Moving this to the Builds fora. hajj_3 wrote: The extension MinimizeToTray revived (https://addons.mozilla.org/en-GB/thunde ... y-revived/) no longer works on Thunderbird 60 beta, there are no other working addons either with this functionality either. This is the 12th most popular thunderbird addon. This badly needed functionality needs to be integrated in to thunderbird. Reading release notes can be very informative. You can see the option kinda but you can't see any button to accept the changes and you can't click on anything else on the screen, you have to close the program via file explorer but then the changes made are lost. Fortunately the default settings of the addon allow you to minimise to the tray icon, you just can't customize the settings such as right clicking on the tray icon to bring up the menu. Last edited by LIMPET235 on May 7th, 2018, 7:18 am, edited 1 time in total. So when you go to the Menu Button > Add-ons and wait for a bit you don't see a list of extensions? From the Menu Bar it would be Tools > Add-on Options (Add-on Preferences for Linux). If there are Options for the extension, the extension should be in that list. Then I guess the extension isn't compatible with TB 60.0 beta. Looks like development stopped at TB 20. Development of this one stopped at TB 50. 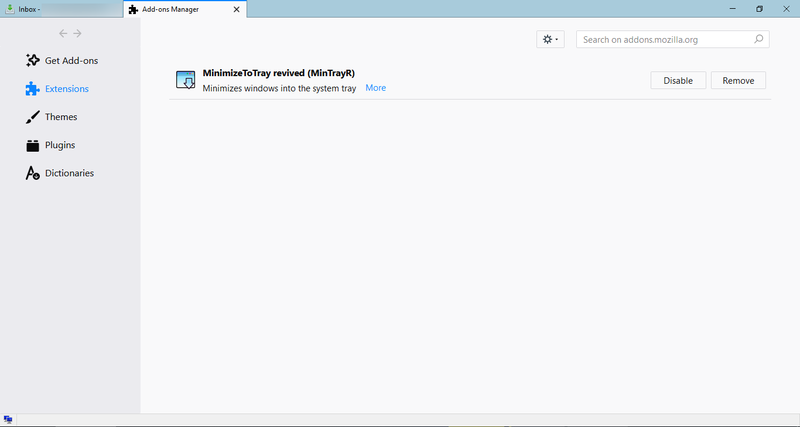 The chances of Thunderbird ever incorporating a minimise to System Tray feature as a built-in feature are very slim. As far as I am aware Microsoft was pressuring software developers to only use the System Tray for notifications (which was a change from previous Microsoft policies on the System Tray).